We are pleased to announce that Schlotzsky’s®, the national bakery-café restaurant chain, has partnered with the Texas Sponsor -A -Highway® program! In the first week of July, Schlotzsky’s® had one of the first signs installed in Austin. 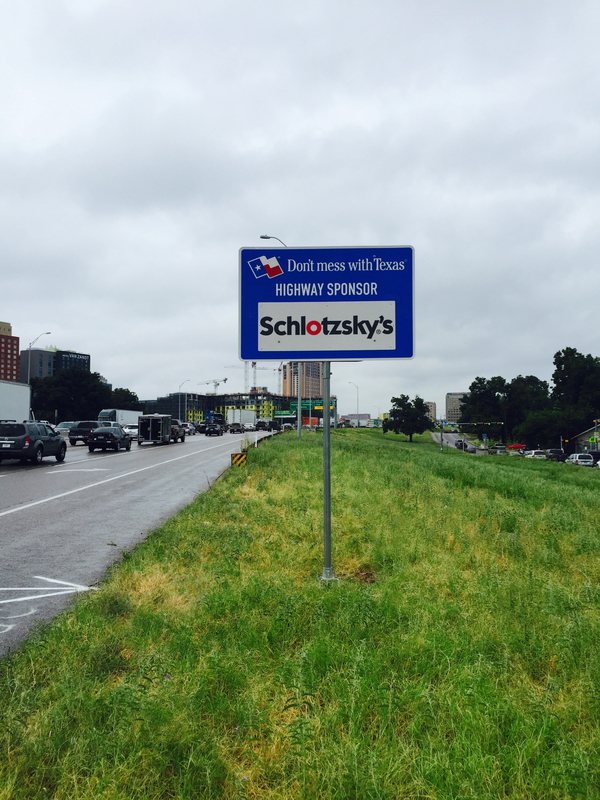 As a sponsor, Schlotszky’s® is funding the upkeep of six different stretches of highway in Austin, all of which will be marked with a Sponsor A Highway® sign. We look forward to seeing the rest of the Schlotzsky’s® signs on display in Texas as the program progresses! Schlotzsky’s® originated in Austin on South Congress Avenue in 1971 with The Original oven-baked sandwich and famous Fresh-from-Scratch® buns. Over the past 40+ years, their menu has evolved and so has their community involvement. Schlotzsky’s® is the fast-casual choice for a quick and fresh dining experience. With more than 100 locations in Texas, the affordable and quirky eatery offers some of the best franchise support for entrepreneurs. Recently, Schlotszsky’s® has launched their app, Lotz4Me, which offers rewards for devoted customers. Schlotzsky’s® continues to grow not only in Texas, but throughout the Midwest with their signature menu items created with Texas in mind! We are excited to see them recognize the importance of highway sponsorship with our brand new program. The Texas Department of Transportation has been our partner and has helped make it possible for restaurants and other businesses to sponsor highways with name recognition panels proudly displayed on their stretch of highway. We are excited to welcome Schlotzsky’s® to the sponsorship program! To find out more, please visit: http://www.schlotzskys.com./.